Flexible & compact high-volume water carrier for outdoor adventures. The Platypus Water Tank gives you a compact and versatile solution to high-capacity water storage - perfect for group hydration without the bulk of a hard-wall storage tank. A wide-mouth Big Zip™ opening makes it easy to fill and clean with a comfortable carry handle and screw cap pour spout. Thanks to its soft-wall construction the Water Tank can be rolled up once emptied for a space saving design. All materials are certified taste-free, BPA-free, BPS-free, and phthalate-free while embedded silver-ion protects the interior from mould and bacteria. A threaded port and 1/4" diameter drink tube make it easily compatible with accessory caps and adaptors. 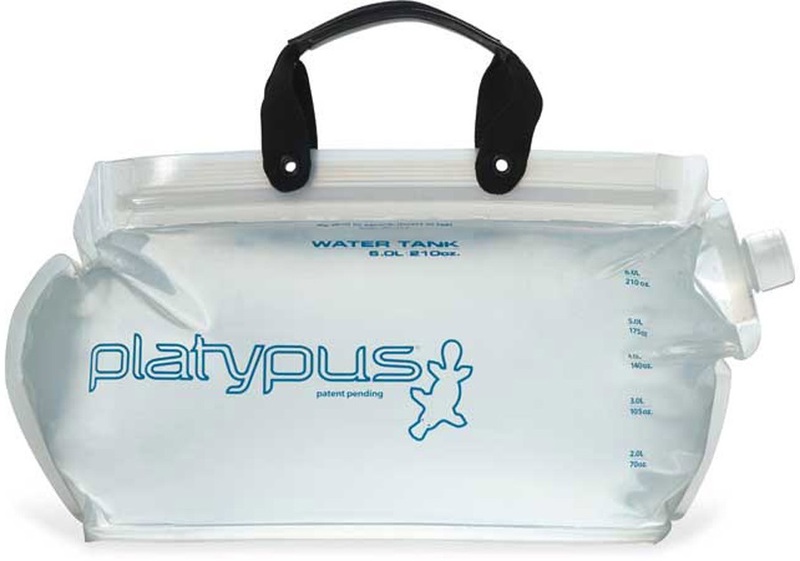 The Water Tank from Platypus gives you a high-quality, reusable water carrier for camping, hiking, or fishing trips - great for Scouting and Duke of Edinburgh Award participants. The flexible design and range of sizing offer versatile and reliable refreshment throughout your adventure. Dimensions: 21 x 41 cm | 8" x 16"